In the big scheme of things it’s almost nothing, just a second of someone’s time. Something I do a hundred times a day, but something many people haven’t ever done and have no desire to ever do. A “like” 0n a Tweet I sent. A touch of a thumb or a click of a mouse. Ever since I’ve been four years old I’ve been fascinated by and madly in love with space travel. When I say that I STILL want to be an astronaut when I grow up, I’m 100% serious. It’s not a figure of speech. I’ve squeed when I’ve gotten to meet astronauts, including some of my true idols. I’ve squeed when I’ve gotten to touch things that actually went to the freakin’ moon. I’ve squeed when I’ve gotten to meet and talk to the women and men who put robots on Mars. 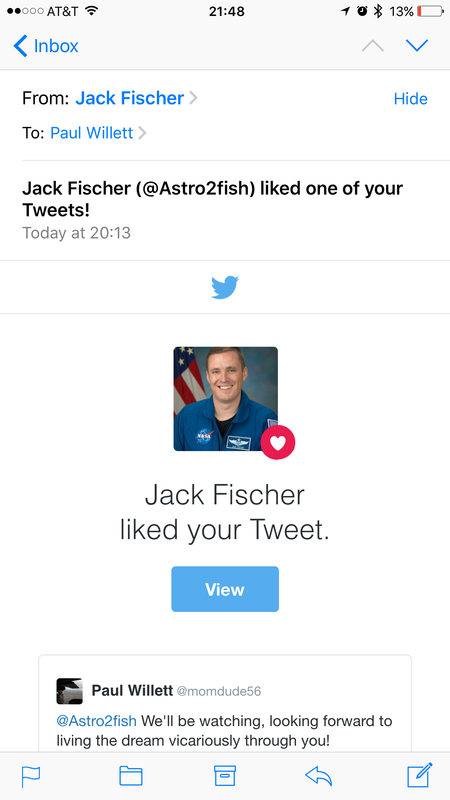 So when I send a Tweet to an astronaut who’s going up to the ISS on Expedition 52/53 and I get a teeny, tiny, simple, almost trivial “like” back – I squee. But when I start second guessing myself for wanting to share that because some societal conditioning in my head thinks I need to “act like an adult”? Well, I have someplace that societal conditioning can stick it and some anatomically improbable suggestions. Being a squeeing four-year-old who’s thrilled and excited and starry-eyed is better than being a staid, boring, responsible adult any day of the week. If I forget that again, you have my permission to smack me upside the head. AWESOME… caps lock by accident but highly appropriate, because —- I have an online friend who’s been ‘liked’ by a real spaceman! I don’t know, but it sounds scary!